2016 Graphic Novel Challenge, book #13, and it's the best one so far! This cute graphic novel is a must for any library serving tweens. It's beautiful, clean, and has many positive messages for tween girls. LOVE, LOVE, LOVE!!! SUMMARY: Twelve-year old Astrid expected her best friend Nicole to attend Roller Camp with her this summer, but Nicole chooses to attend dance camp with another friend instead. 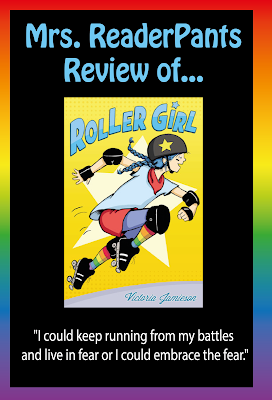 REVIEW: Roller Girl is book #13 on my 2016 Graphic Novel Challenge, and it is my favorite one yet. I adored this book, and I already know it's going to be a massive hit at my school. I loved the illustrations, the facial expressions, the lessons learned, and of course, the roller skating! I love how real the story is. Astrid deals with friend drama and misunderstandings and the fact that best friends can still have other friends. Astrid deals with difficulties with her mother, and many girls will identify with that struggle as well. Author/illustrator Victoria Jamieson certainly knows her audience. Every library that serves tweens needs Roller Girl, probably multiple copies. THE BOTTOM LINE: A must-read. Adults will also like this one--I sure enjoyed it! STATUS IN MY LIBRARY: We have two copies. Sounds good to you? Click here to buy Roller Girl from Amazon!